The other day in my Audiology class my professor introduced us to a chart that outlined different types of hearing loss. Sound can be conducted either by air or bone and a blockade at any point in these pathways can lead to conductive, sensorineural or mixed hearing loss. He moved on to speak about tuning fork tests that are used to roughly determine what kind of hearing loss there might be. By no means do tuning forks rival the most advanced audiological software, but it provides a simple and non-invasive way to investigate where the hearing difficulty might lie. The tuning fork test that caught my attention is entitled: "Bing." The reason this particular tuning fork test caught my attention is that the test incorporates the "Occlusion effect." What might this be you ask? Well, you conduct the Bing test by striking a tuning fork and placing it on your mastoid (the hard bony region behind your ear) while opening and closing your ear using your finger (by pressing on the flap of skin over your ear canal hole). If you hear a pulsating sound... congratulations! This means that the test is positive and you have normal hearing! If there is no change in loudness, this might indicate conductive hearing loss... No worries, though, I conducted all of the tuning fork tests in lab the other day and most of them suggest that I have some kind of sensorineural hearing loss... yeah, I really don't think that is the case. There is a lot of room for experimental error with tuning fork tests. What might any of this have to do with choral singing you ask? Well, I am sure that, for those of you who have sung in groups before, you probably have come across people who love to plug one or both of their ears while singing. This is one of my choral pet peeves. 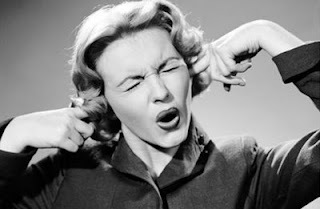 Not only does it make you look elitist, like everybody is around you is singing so poorly you have to block them out in order to hear yourself, it also occludes your own hearing and actually alters the way you hear your own voice! The occlusion effect is a low-pitch phenomenon and the reason there is a pulsating sound, as well as the perception that you can hear yourself better, is because the the long wavelengths of low pitches can't escape from the ear canal. These low frequencies are what you hear when your ear is plugged. Thus, when people are singing and plugging one ear, not only are they blocking out the people around them but they are mainly listening to their own low frequency feedback. O.k, I understand if somebody plugs their ear for a moment to check a note (I have done it myself a few times). It's seems like a reflex to do it, since you feel like there is no other way to hear yourself, but the physics of sound tells us that it doesn't actually help. It actually might make you think you are singing lower than you actually are due to the low pitch feedback you are hearing by plugging your ear canal. I suppose the only exception is if you are a rock singer and ear plugs are necessary so that you won't lose your hearing while singing next to loud instruments. However, I do not believe that the decibels produced from choral singing are enough to cause long term hearing damage. My worse experience one time was when I was rehearsing for a singing exam and one of our members was slightly less experienced chorister. For the singing exam, we were placed in groups of 4, one for each part, and I noticed that this particular chorister was struggling with our rehearsal piece for the exam. They found it hard to come in on the right note and sing alongside somebody who was not on the same part. Thus, this unnamed chorister resorted to plugging their ear for all the rehearsals, which, by the way, didn't help their singing or the group blend. It was frightening listening to that chorister warble off-key while keeping a solid finger lodged firmly in their ear. Needless to say, they bombed the singing exam. Take it from me, the bad grade of the ear-plugging chorister, and my Audiology prof. Try not to plug your ears while singing! It is not helping you or anybody around you! Plus, won't you look much classier while singing when a finger isn't jammed in your ear? Wow, I have sung in choirs for a long time and I've never seen anyone do the plug-the-ear thing. But maybe that's because I'm too self-centered -- either looking at my music or the conductor and am focused on getting my part right. When choir starts up this season I'm going to get my nose out of my music and look around a little and see if there are people in my choir doing this. Also, it has NEVER occurred to me to plug my ear to hear myself momentarily to check a note! I'm glad you explained that thing about singers plugging (or sometimes cupping) their ears. I've been seeing singers doing it for years (more among soloists than among choristers) and have always wondered, as you suggest, whether they're trying to block out the sound of others they don't want to hear. I've sung in choirs and rock bands. In rock bands, I found it was a life saver. You just can't tell any other way when you're singing in some settings. I don't think I've ever plugged my ear in choir, but I wouldn't hesitate if the occasion warranted it. Although it might not provide an accurate representation of pitch, it's a constant representation of pitch. The changing hall accoustics, the changes in who is singing next to you, etc all erode your ability to confidently hear yourself. But no matter where you are, you can plug one ear and have a reference point that is pretty much unchanged. It was good enough for Ella Fitzgerald. PS: I find it only works with one ear. For some reason, the other one is useless, even though I have excellent hearing in both.